Seriously, they’re like textbooks awaiting first print while emerging as examples of way Tech separates itself from other NCAA athletic programs to provide opportunities to merge athletic skills and sublime brainpower into lucrative careers. Kazaroff, a fourth-year junior on the volleyball team, is the only student-athlete among Tech’s 400 or so who is majoring in nuclear and radiological engineering. That program admits 20 students a year campus-wide. There are no fresh memories among Tech’s athletic advisory staff of anyone majoring in this. And Rivera, the starting free safety on the football team, is in graduate school majoring in quantitative and computational finance. He’s the only one of those among SAs either in undergrad or grad school. Nobody remembers that, either. Surely, you have questions, like, where might these degrees carry students? What will they do? What is nuclear and radiological engineering all about? “There’s the hard-core nuclear engineering side, and then there’s the medical side. I don’t really know much about [the medical side] because I’m not interested in it,” Kazaroff explained. “There are people who work with X-rays, and dosimetry is people who assess radiation doses after, like, a Fukushima or Chernobyl accident and make sure things are safe. Both student-athletes began college elsewhere. Kazaroff, who’s from Apex, N.C., transferred to Tech in 2017 from Virginia, and Rivera, who’s from Jacksonville, graduated in May from Wofford with degrees in mathematics, finance and computer science. He’s taking all of those fields further in Tech’s QC+F graduate program. Actually, Rivera’s path toward predictive finance has been kind of predictable, dating back to his peer group at Bartram Trail High School in Jacksonville. He had a couple shoulder surgeries as a senior, and was fascinated by working with physical therapists. So, when he went to college, “I started off wanting to be a biology major. Then, I took the first couple biology classes, and that wasn’t for me,” Rivera said. “I had already early enrolled in upper-level math classes, because I graduated [from high school] AP in Calculus A, B and C. They put me in multi-variable, and I really liked the teacher, so I knew that if I wasn’t going to do biology, I was going to do math. Rivera found himself in a couple of finance study groups at Wofford – he cited an investment project as particularly inspiring – and eventually followed two group mates who graduated a year ahead of him, Richard Fields and Cole Higbie – to Tech’s QC&F graduate program. His former position coach at Wofford, first-year Tech safeties coach Shiel Wood, lent an assist. Kazaroff’s trail to Tech has been more individualistic. 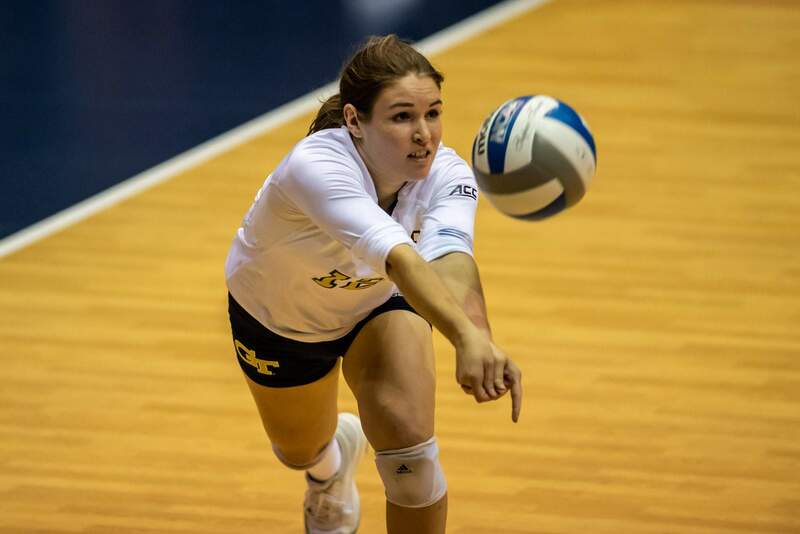 Her parents urged their only child to try volleyball in seventh grade. “They were wanting to expose me to different sports, nothing serious, at the parks and recreation center. Soccer, softball. I really wanted to play football, but my mom wouldn’t let me,” said the defensive specialist. Upon graduating from Apex High, Kazaroff sought to be an engineer. One class led to several others, and an interest in nuclear engineering, which would have to be at another school; Virginia doesn’t have the major. “I took modern physics my first semester of sophomore year, and the same professor had a class the next semester, an introduction to nuclear physics, and I was really interested in that,” Kazaroff recalled. “I was like, ‘How can I do more of that?’ and then I realized I was looking at transferring. Kazaroff was not immediately admitted to the nuclear and radiological engineering program at Tech. She had to get some other classwork out of the way as she redshirted in 2017-18. She’s in now, and helped in research last summer. She has played in most volleyball matches this season, helping dig balls out on the back line. Rivera has started every football game. Football, in fact, was the final vote that swung him to Georgia Tech. “Two of the students that were in that fund [at Wofford] came to Georgia Tech and are in the exact same program. That’s what drew me to this program,” Rivera said. “I looked in the Southeast. I knew NC State had a similar program, Georgia Tech, Florida State. Georgia Tech had the best program just based on the statistics that kept coming up. For as smart as Rivera and Kazaroff are, they missed one question in similar fashion. Asked if the Georgia Tech Athletics Association provided tutoring for their unique majors, they both said no, yet they both said they’re not the type to seek tutoring anyway. They’re both sort of right. The GTAA does not have nuclear and radiological engineering tutors nor quantitative and computational finance tutors on speed dial. But if Kazaroff or Rivera want them, tutors will be found by the AA. “What we’ll do is work with the school or college to get referrals [for tutors in rare majors],” said Chris Breen, the assistant athletics director/student services who helped guide Rivera through his application process. Neither have asked for aid. “She’s not one to want tutoring,” said Whitney Burton, associate athletics director/academic services. “Generally, she meets with her professors a lot and prefers to get help that way. Sometimes, when you have a unique major, once they get a little further up into their courses, it’s a better resource for them to go into their professors. Few want to do what Kazaroff is considering, and her schedule is difficult in many ways. “I’d like to go into mathematics for a graduate degree and then bring it all back together and work for the intelligence community one day, whether it’s cryptography or national security stuff with nuclear weaponry or non-proliferation,” she said. “Reactor physics II is probably my hardest class. It’s right in the middle of practice on Tuesdays and Thursdays. Rivera was accustomed to having five or six classes per term at Wofford, so having four at Tech, where he hopes to graduate with a master’s degree in Dec. 2019, is kind of cool. He even found time on Sat. Oct. 6, the day after the Yellow Jackets won at Louisville, to drive to Chattanooga, where Wofford was playing. Generally, though, his schedule of corporate restructuring, machine learning for trading, entrepreneurial finance and private equity, and design and implementation of systems to support computational finance eats quite a bit of time. Story originally appeared on Ramblinwreck.com.